Next year in 2010, there are a lot of silver weddings being celebrated mainly my old school friends in the Uk, mine included. One of them has decided to celebrate their 25th wedding anniversary by walking up the aisle again and sayin " I DO " and after the wedding the wedding breakfast/ party will be celebrated in the style of the year 1985. I have been extended an invitation, would love to go and if I do I hope it'll be better than the last wedding I went to..............first time I couldn't wait to get away from a celebration , food was bland , beverages scarse, company not the best and the music you couldn't even hear !!!. 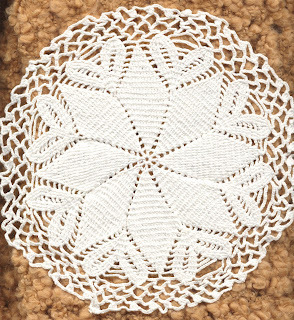 I've been making some gifts for my friends, some crochet doilies as that's what I was crafting in 1985 , using very fine Sicilian crochet thread and a very tiny crochet hook mainly 0.75 mm or 0.8mm and sometimes 1.25mm. Need to wash the beige one as someone decided to put their cup of tea on it !!!!! I'm pleased with the way they have turned out as It's been ages since I've crafted any of these as I've been mainly concentrating on the mixed media sector. 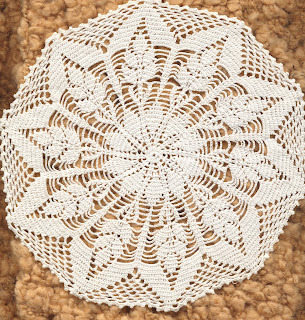 Think I will make these on a more regular basis as it was very relaxing. 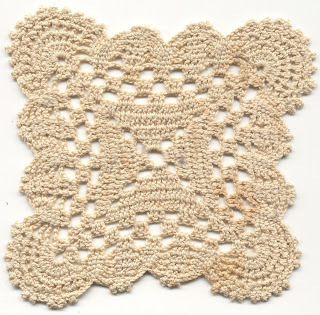 I'm now making granny squares, don't know whether to make a blanket, slippers, pot holders or a waistcoat. I've also started knitting some winter jumpers , they knit up in a day as you use one big needle and one small needle. I originally bought the patterns in 1982, they are called odd pins. Here it used to get up people's nose ( probably still does !!! ) when I used to say I used to do that years ago....but if we look around all those old crafts are coming back into fashion. I learnt to knit and crochet when I was 6 years old and we also learnt to knit and sew in junior school .....even the boys .....greyt times.